A tree born from the little seed symbolizes a growth of a family. 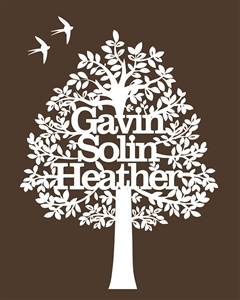 This typographical paper cut family tree is hand cut from a sheet of soft white paper. With your choice of a frame and a colored backing paper, you will find the perfect match to your taste or decor. Your 100% hand cut paper art is framed in our Chicago art studio and ready to hang. It becomes a thoughtful gift for a beautiful family. It also makes a unique first anniversary paper gift! Paper: We use special white paper with matte finish to show fine details. It is acid-free, lignin-free and recyclable. Process: Your wordings will be designed into the tree by our gifted graphic artists. We will send you online preview of your paper cut layout within 1-3 business days. After your approval of the layout, we will start the hand cutting. Frame: Our slick wood frame, in black or white, makes this delicate family tree a beautiful conversation piece ready to hang for any room. BEAUTIFUL piece, perfect for an anniversary present!